Can Volunteers Save Federal Lands and Create a Hiring Pipeline for Agencies? 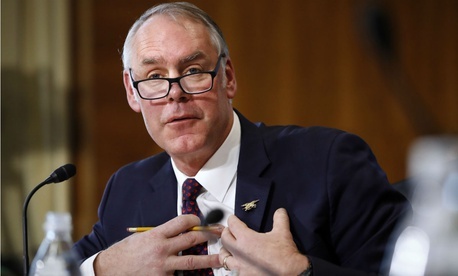 A group of Democratic lawmakers is sending a letter to Interior Department Secretary Ryan Zinke urging him not to backtrack from any diversity initiatives, citing reports that the agency would no longer prioritize ensuring its workforce represents an array of Americans. Interior should both “recruit and hire exceptional individuals from all background[s]” and “increase access to public lands for historically underrepresented communities,” the more than 30 House members told Zinke. They encouraged the secretary to adhere to Interior’s Diversity and Inclusion Plan, which the Obama administration issued in 2015. The lawmakers drafted their letter following a CNN report that Zinke told employees internally that “diversity isn't important” and “I don't care about diversity.” The secretary reportedly added that his sole focus was getting the best person for a given job, regardless of the person’s background. Interior has denied that Zinke made the comments. The members called on Zinke to take concrete actions to proactively boost diversity "through equity-based, goal-oriented, measurable strategies both in our parks and throughout DOI." The lawmakers said Interior’s bureaus play a “critical role” in preserving public lands and “cultural treasures,” adding the National Park Service in particular should strive for inclusivity and diversity. They noted in 2016, white visitors to national parks were “staggeringly overrepresented.” The members requested that Zinke continue current diversity programs launched under Obama, such as Every Kid in a Park, Urban Agenda and Find Your Park. “Through mutually beneficial, meaningful relationships and focused recruitment, these programs offer opportunities for people of color to make themselves heard and to meaningfully engage with the system,” the lawmakers said. They added that Zinke should ensure that diversity programs have sufficient financial support. Interior did not immediately respond to questions about the letter.